Jeff Glucker October 27, 2018 Comment Now! 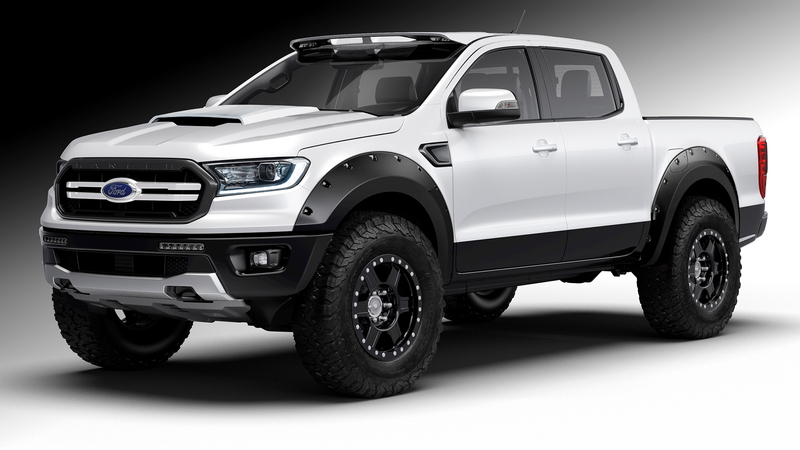 Fans of Ford pickup trucks are in for a treat at the SEMA show this year. The Blue Oval is working with a slew of partners to present an armada of modified pickups. And this year it's not just the F-150 and Super Duty either, as Ford has handed out a few examples of its new Ranger. 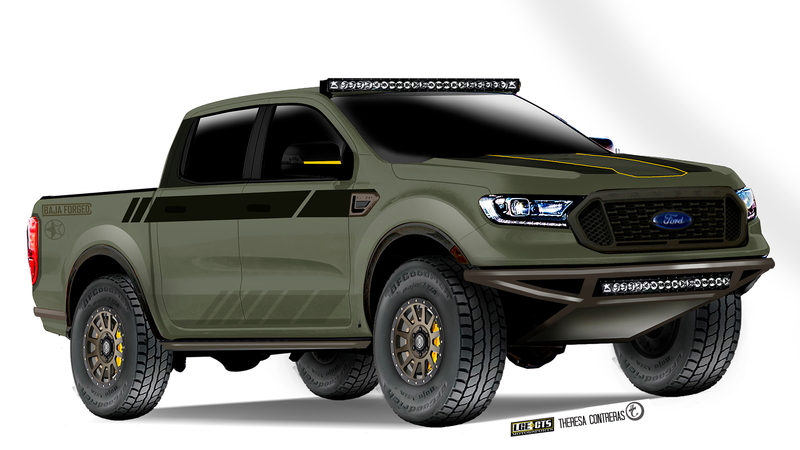 In total, Ford will see seven modified Rangers on display at this year's SEMA show which runs next week. The idea behind each is fairly varied, so there should be a version for all sorts of truck lovers in attendance. The most basic example has been modified in house by the Ford Performance team. This truck features an upgraded Fox shock setup and leveling kit, Ford Performance wheels, a string of auxiliary lights just below the grille, and a front bumper with an integrated skid plate. The Ranger Base Camp is for those looking to get outdoors and then stay there for a bit. Above the bed is a Yakima rack with a SkyRise rooftop tent. A handful of Ford Performance parts help round out the off-road upgrades. On the other end of the spectrum is a truck designed for those who just want to stay inside. It's the Xbox Range, and it packs a set of Xbox One X consoles behind the rear seats. A set of headrest mounted screens let folks play the consoles that are already loaded up with the new "Forza Horizon 4" video game. 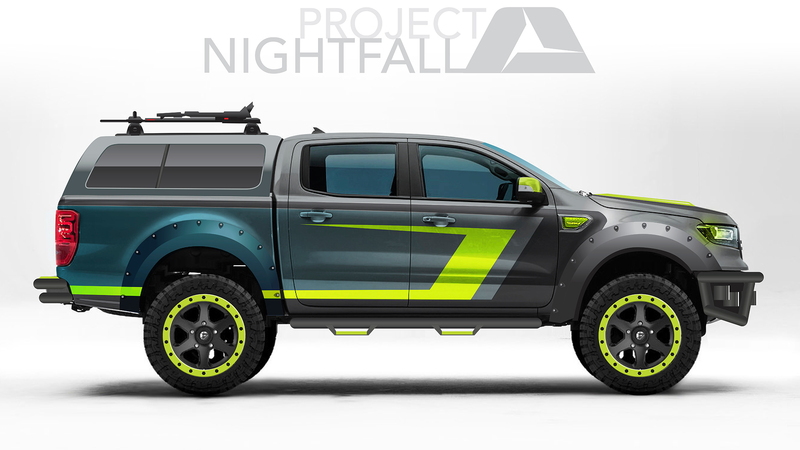 Project Nightfall is a Ranger for urban adventures. It has the styling and chops to get dirty, but the interior also boasts reworked upholstery and a Kicker audio system. Stepping up for serious overlanding, the Project Ranger X is the work of BDS Suspension. An airlift rear bag system will keep you out of trouble and the BFGoodrich Mud Terrain MK3 tires will keep you moving in the slippery stuff. One of our favorite Ranger builds, however, is the Baja-Forged example finished in dark green with black accents and bronze wheels. The look is tough, and this is the way we'd style a Ranger of our own. On the full-size side of things, Ford has another seven trucks rolling out to Las Vegas for the SEMA show. These range from the F-150 on up to the F-350 Super Duty. In fact, the Extang Truck Bed Covers F-350 is one of the cooler trucks being shown. Under the hood is the 6.7-liter Power Stroke turbodiesel engine. Out back is a large OLED TV, a banging sound system, and a full BBQ grill. 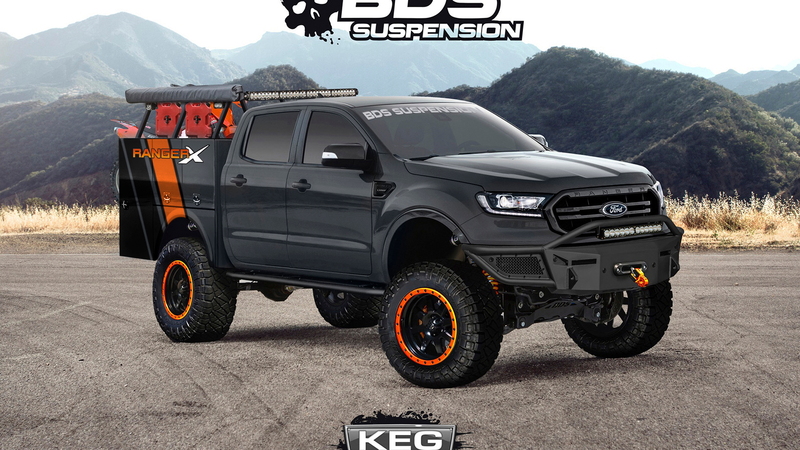 This thing is made for tailgating, and when it's done and riding down the road it looks mean with its duallie setup. Ford also has various adventure trucks, such as the F-250 Super Duty by Wilderness Collective and the F-150 Transfer Flow with its kayak on the roof. 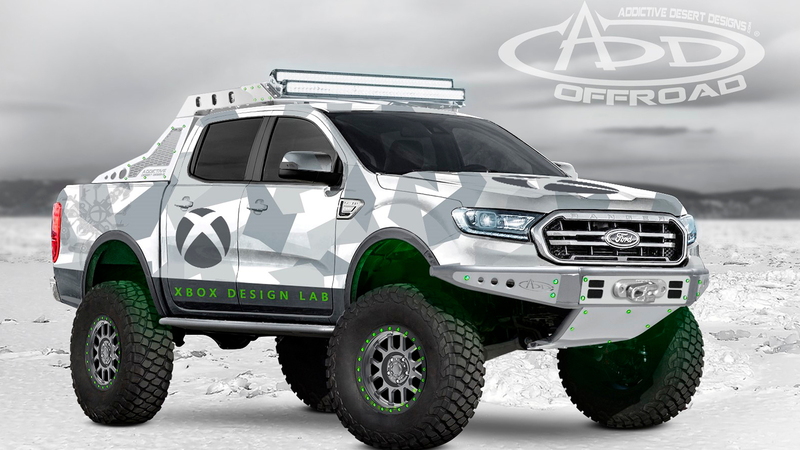 The maddest of them all, however, is the F-150 designed by Kurt Busch and ZB Customs. Starting with a 5.0-liter V-8 equipped truck, the team has added a pair of turbochargers, forged pistons, and more, and the result is a 1,000-horsepower pickup. Like we said, there's a Ford truck on display at SEMA for everyone. Be you power mad or looking for adventure in the woods, Ford's got you covered. The automaker also has you covered if you're more into muscle cars or SUVs. This year's SEMA show kicks off in Las Vegas on October 30. For our complete coverage, head over to our dedicated hub.